The color guard captains (Emma Beintema, Lindsay Garcia, Alayna Wittmer, and Liliane Gendron) receiving their section leader awards. Photo by Corinne Macdonald. 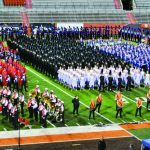 As the Rockford High School Marching Band (RHSMB) concluded a successful and fruitful season, the whole band came together on November 20, 2018, to celebrate their achievements. At the DeltaPlex Arena in Walker, Michigan, the band students and their families enjoyed a fun night filled with good food, drink, and awards. Band director Brian Phillips started the banquet by giving an annual review of the season’s events, including the back-to-back State Championship and receiving 14th place out of 108 bands at the Grand Nationals competition down in Indianapolis. Phillips also publicly thanked his staff and everybody else who had taken their time to volunteer and help with the band’s success. 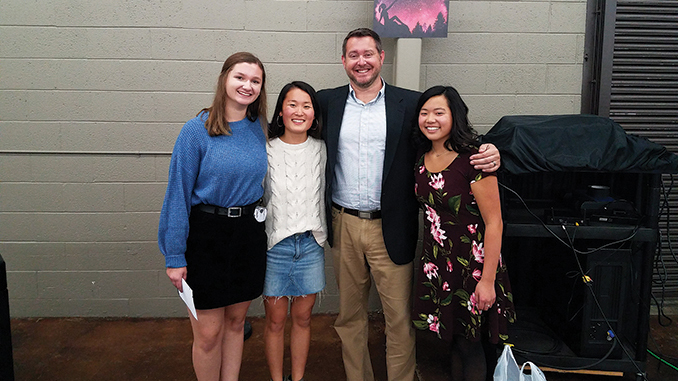 Afterwards, speeches were given by seniors Amanda Featherston, Britney Nicholson, Aidan Fayhee, and Dwight Hua—all of which involved a small recap of the past four years of the seniors’ marching seasons. Band director Brian Phillips with students Lindsey Schmidt, Emma Kramer, and Jessica Danowski. Photo by Eric Kramer. Next, awards were given out to students who had been in the program for three years and those who have been apart of it for all four. After this portion of the ceremony, plaque awards were given out. These awards involved the recognition of the Drum Majors, Section Leaders, “Outstanding Performers,” “Outstanding Leadership (non-section leaders),” “Rookies of the Year,” and the “National Marching Band Award.” The Drum Major plaques were awarded to Brandon Guetschow (11th), Dwight Hua (12th), Britney Nicholson (12th), and Hannah Prost (10th). The students received these awards in recognition for all the hard work and effort put into leading the band of 200+ Students. 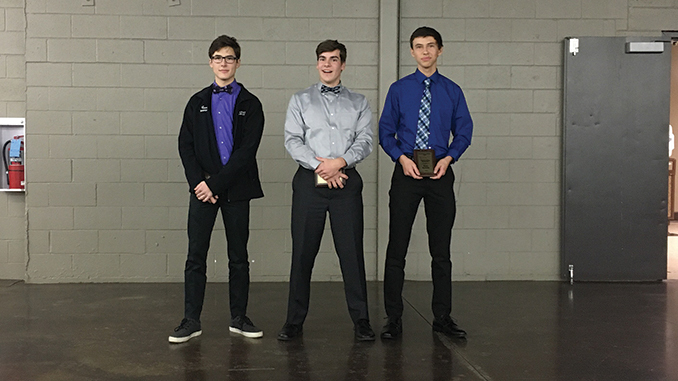 Seniors Cameron Shope, Aidan Fayhee, and Ryan Steinke receiving their section leader plaques. Photo by Andrew Nicholson. Section Leaders were also given awards in recognition of their outstanding leadership during the season and were awarded as follows: Emma Kramer (12th), Brianna DeMan (11th), Erin Gaynor (11th), Allison Werkema (12th), Emily Arnold (12th), Evan Coberly (12th), Tommie Rice (12th), Zoe Dunnum (12th), Amanda Featherston (12th), Evan Powers (12th), Kyle Hintz (12th), Tyler DeRoo (11th), Aidan Fayhee (12th), Sam Gordon (12th), Bryce Kliewer (11th), Tuori Webster (12th), Veronica Tranquilino (12th), Cameron Shope (12th), Cole Laven (12th), Kate Sapkowski (12th), Mason Van Dorp (11th), Jack Snowden (12th), Brett Zacharias (12th), Zachary Abberton (12th), Sam Mattson (12th), Emma Beintema (12th), Liliane Gendron (11th), Alayna Wittmer (10th), and Lindsay Garcia (12th). The next award was given to band students who were acknowledged for their outstanding performance on the marching field. 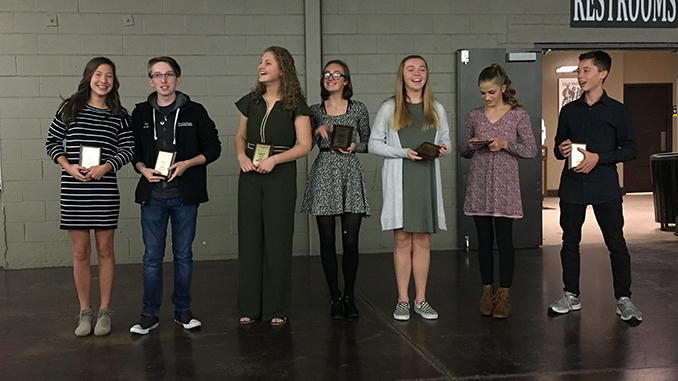 The award, entitled “Outstanding Performer,” was given to the following students: Aidan Fayhee (12th), Emma Kramer (12th), Cameron Shope (12th), Evan Coberly (12th), Alayna Wittmer (10th), Brett Zacharias (12th), and Ryan Steinke (12th). 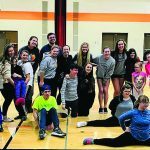 While Section Leaders were given the official title of being leaders of the band, the Rockford Band program also likes to acknowledge other students who have been role models. 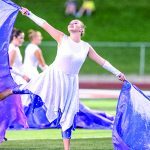 While these students aren’t necessarily “section leaders,” these students still portray honorable traits and attitudes that carry the spirit and leadership for the RHSMB. The following students are as follows: Ella Brodowski (10th), Jessica Danowski (12th), Mya Beintema (12th), Jon Gluth (12th), and Evan Orvis (12th). 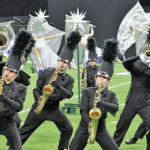 Every year, students are awarded for being “Rookies of the Year.” These people are not necessarily freshman, just those new to the ensemble who have adapted to the team well and portrayed excellent practice etiquette and performance technique. Seven students received the “Rookie of the Year” award, including Elise Whittaker (9th), Maura Conrad (9th), Jenna Coyle (9th), Carson Lafferty (9th), Adeline Renberg (10th), Dana Hammer (9th), and Sean Deward (12th). The rookies of the year (Jenna Coyle, Sean Deward, Elise Whittaker, Adeline Renberg, Maura Conrad, Dana Hammer, and Carson Lafferty) receiving their awards. Photo by Andrew Nicholson. Finally, a student is awarded the “National Marching Band Award.” This honor goes to someone who has portrayed an outstanding devotion to the growth and community of the ensemble and has shown excellence in all aspects of performance and leadership. This year, the student to receive this award was Drum Major Dwight Hua (12th). All of the award recipients were voted by the students and immediate staff. The ceremony concluded with the band watching a short preview of the annual video of the season in review created by parent volunteer Aaron Sundman.